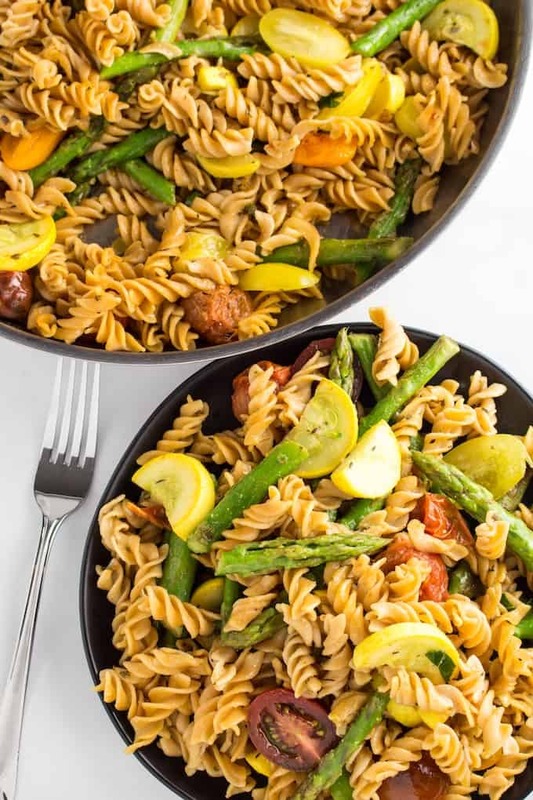 Gluten Free Pasta & Veggies Skillet is a quick and EASY vegetarian dinner made with asparagus, yellow squash, and cherry tomatoes mixed with olive oil, pasta, and seasoning, ready in under 30 minutes! There is a lot you can do with gluten free pasta, and this week we’re planning our menu to include One Pot Chicken Parmesan & Pasta, Chicken Broccoli Alfredo Bake, and Baked Buffalo Chicken Mac and Cheese! 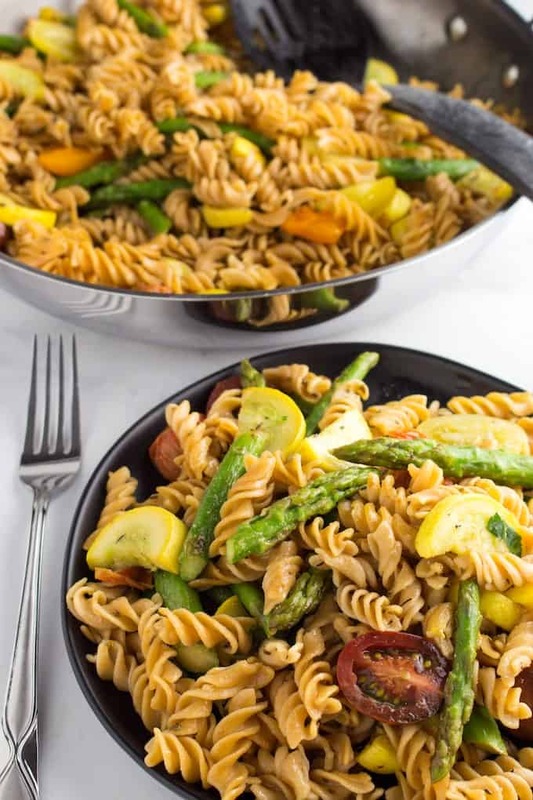 Gluten Free Pasta & Veggies Skillet is a quick and easy weeknight dinner with plenty of fresh vegetables, made with asparagus, yellow squash, tomato, garlic, herbs, and of course, gluten free pasta. It’s really quick and easy to make, and comes together in under 30 minutes! Which means that this is one of my regular go-to dishes on weeknights when I get home from work. This recipe is vegetarian, but you can add some grilled chicken or steak on top if you want to add meat. Or change up the vegetables to whatever you have left over in your fridge that night! Does gluten free pasta taste the same? Personally, I don’t think gluten free pasta is all that different. But a lot of this depends on what brand you choose, because the different brands are made of different ingredients. I like the corn-based noodles, but you should try a few and see which one you like the best. We only use gluten free pasta in this house, and I haven’t had any complaints yet. Is gluten free pasta lower in carbs? Sadly, no, gluten free pasta is not lower in carbs. In fact, gluten free foods are often higher in carbs than their regular counterparts, making them no healthier than normal pasta. So just like always, it’s important to eat gluten free pasta in moderation. What other vegetables can I add to this gluten free pasta? 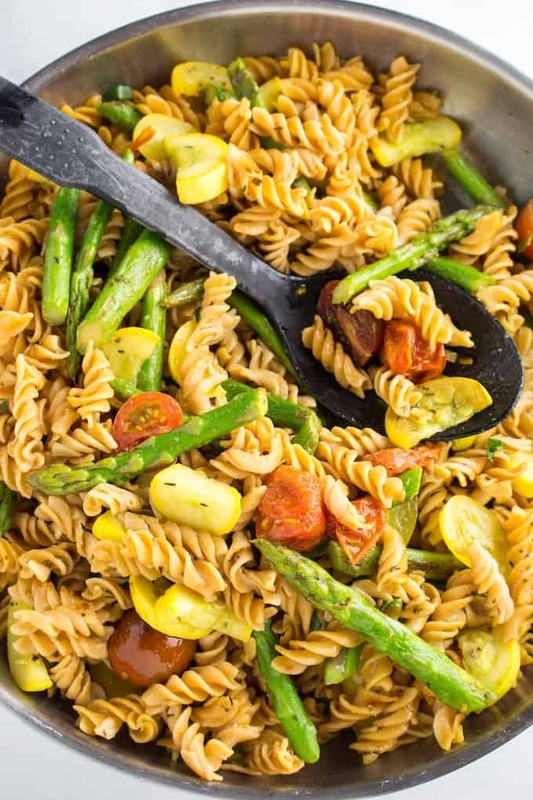 Can I freeze this gluten free pasta & veggies skillet? I do not recommend freezing this dish, because gluten free pasta has a tendency to overcook easily. So when you reheat it, it falls apart. If you want to prep this ahead, you can cut up the vegetables and freeze them in plastic ziplock bags until you’re ready to cook. If you leave this in the refrigerator, it will last 2-3 days, but the pasta will not be as good as when it’s freshly made. 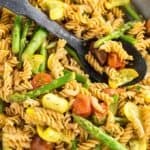 Tips for making gluten free pasta & veggies skillet! Make sure you rinse your pasta after it’s done boiling. 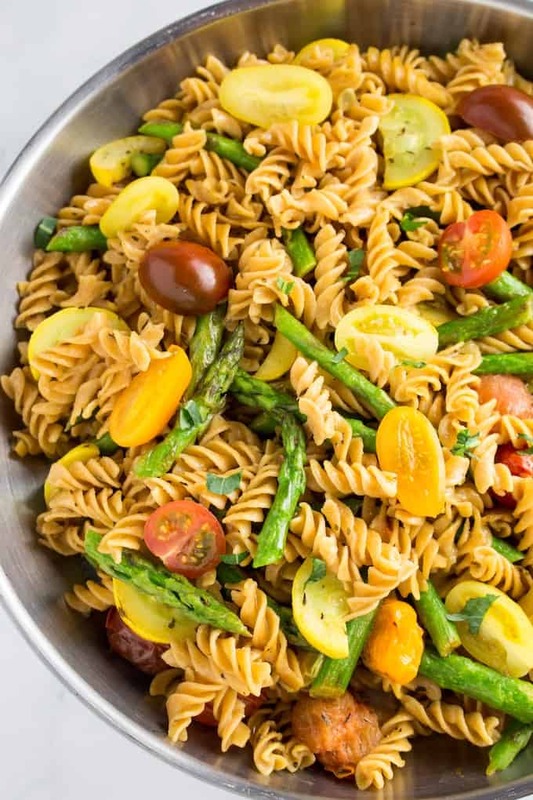 Gluten free pasta is easy to overcook, so while you wouldn’t do this with regular pasta, it’s important to stop gluten free pasta from cooking. You can add whatever vegetables you have for this recipe, or use up leftovers from the night before! Add a little bit of heat by adding some diced jalapeños, or 1/4 tsp of cayenne pepper. 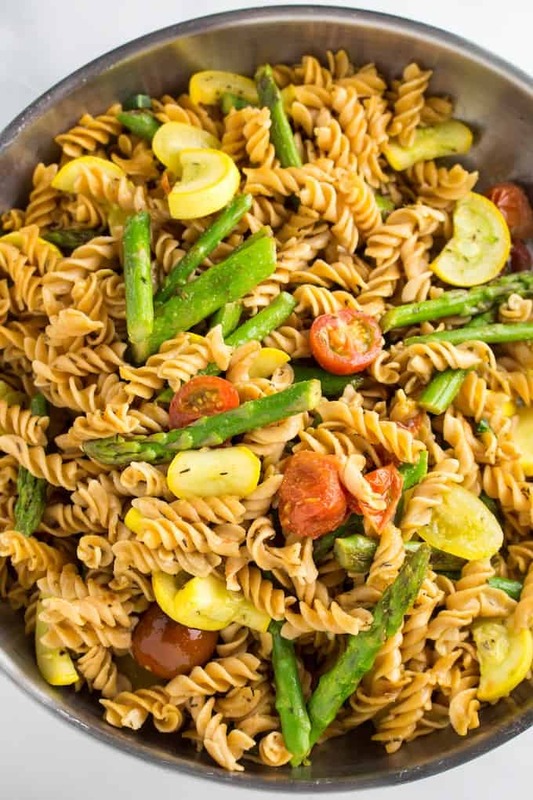 You can use a tablespoon of butter and 1/4 cup of parmesan cheese to make this a gluten free pasta primavera dish! I like to use cherry tomatoes because I like how they burst when you bite into them, but you can use diced Roma tomatoes if that’s what you have. Make sure you snap the ends off of the asparagus, to get rid of the chewy fibrous part. I like to get my veggies going while my pasta is boiling, but if you make your pasta first then drizzle it with some olive oil to keep the pasta from sticking together. Cook pasta to al dente (not quite cooked through) and rinse with cold water, about 5 minutes. In a large skillet over medium-high heat, saute vegetables in 2 tbsp olive oil and seasoning for 3-4 minutes, until just soft. Add pasta and remaining olive oil and toss together until pasta is warmed and cooked through before serving. Click on the time in the directions to start a timer!